We close the tablets we've written on. Stories written with eyelids wet. Are twelve new volumes which the Lord has made. For us our daily lives to write. New lessons to learn and victories untold. And fashion our lives by your mighty power. We write the story of another year! my heart to fear thy name. My Gramma Hoover kept this little piece in her Bible. It is a good reminder. If God has called you to be really like Christ in all your spirit, He will draw you into a life of crucifixion and humility and put on you such demands of obedience, that He will not allow you to follow other Christians, and in many ways He will seem to let other good people do things which He will not let you do. Others can brag on themselves, and their work, on their success, on their writings, but the Holy Spirit will not allow you to do any such thing, and if you begin it, He will lead you into some deep mortification that will make you despise yourself and all your good works. The Lord will let others be honored and put forward, and keep you hid away in obscurity because He wants to produce some choice fragrant fruit for His glory, which can be produced only in the shade. Others will be allowed to succeed in making money, but it is likely God will keep you poor because he wants you to have something far better than gold and that is a helpless dependence on Him; that He may have the privilege of supplying your needs day by day - out of an unseen treasury. God will let others be great, but He will keep you small. He will let others do a great work for Him and get credit for it, but He will make you work and toil on without knowing how much you are doing; and then to make your work still more precious, He will let others get the credit for the work you have done, and this will make your reward ten times greater when He comes. The Holy Spirit will put strict watch over you, with a jealous love, and will rebuke you for little words and feelings, or for wasting your time, which other Christians never seem distressed over. So make up your mind that God is an infinite Sovereign, and has a right to do what He pleases with His own, and He will not explain to you a thousand things which may puzzle your reason in His dealing with you. He will wrap you up in a jealous love, and let other people say and do many things that you cannot do or say. Settle it forever, that you are to deal directly with the Holy Spirit, and that He is to have the privilege of tying your tongue, or chaining your hand, or closing your eyes, in ways that others are not dealt with. Now, when you are so possessed with the Living God that you are, in your secret heart, pleased and delighted over this particular personal, private, jealous guardianship and management of the Holy Spirit over your life, you will have found the vestibule of heaven. John 10:2-4 But he that entereth in by the door is the shepherd of the sheep. To him the porter openeth; and the sheep hear his voice: and he calleth his own sheep by name, and leadeth them out. And when he putteth forth his own sheep, he goeth before them, and the sheep follow him: for they know his voice. Here is a tutorial for a beautiful table runner that is pretty easy to make. I really like the blue snowflake version, but this could be made for other seasons and events with other fabrics “fussy cut” for the feature squares. One thought that occurred to me is that this pattern could be used to showcase some vintage embroidery. You could fussy cut embroidery pieces, fabrics or handkerchiefs for the 6 1/2” feature squares and then use complementing fabrics to set them off. This would be a neat way to repurpose some vintage items and get some enjoyment out of them. There are so many ways that Christmas can be a disappointing holiday. I have friends who had a horrible stomach bug one year on Christmas Day. They tried to celebrate anyway, but it was pretty pathetic. Then there are the annoyances of family contention that sometimes mar the day. Let’s face it, not everyone always gets along and “plays well together” at family gatherings. If someone who has a strong personality happens to be in a bad mood they can ruin the day for everyone else. There are also the disappointments when plans go awry for one reason or another. Maybe someone can’t make it. Maybe the weather was too bad for travel. Maybe you ruined the dinner. Maybe the family you were counting on to come be with you decided to go somewhere else or are sick. Then, if we’re going to be honest, some years your gifts just stink. You don’t get a thing you wanted or the budget is so tight that you have to forego your own wishes in sacrifice for others. Sacrificing for others is a good thing to do, but there was quite likely a small part of your own heart that was just a little disappointed. Of course, a lot of people are disappointed in the holiday because they don’t have other people to be with who really care about them. Maybe you are alone. Maybe no one invited you to join them because you don’t have any family near by or just because they were thoughtless and selfish. Maybe you are depressed or suffering from SAD and can’t enjoy the day. Whatever the case may be, if you are child of God through faith in Jesus Christ, I’d just like to encourage you to remember that the Lord loves and cares for you and that He is touched by your feelings in this disappointment. Hebrews 4:15-16 For we have not an high priest which cannot be touched with the feeling of our infirmities; but was in all points tempted like as we are, yet without sin. Let us therefore come boldly unto the throne of grace, that we may obtain mercy, and find grace to help in time of need. If you are not a child of God yet, you can start having a better day now by believing on the Lord Jesus Christ and putting your faith in Him for the eternal salvation of your soul. Romans 10:9-13 That if thou shalt confess with thy mouth the Lord Jesus, and shalt believe in thine heart that God hath raised him from the dead, thou shalt be saved. For with the heart man believeth unto righteousness; and with the mouth confession is made unto salvation. For the scripture saith, Whosoever believeth on him shall not be ashamed. For there is no difference between the Jew and the Greek: for the same Lord over all is rich unto all that call upon him. For whosoever shall call upon the name of the Lord shall be saved. Isaiah 53:3-6 He is despised and rejected of men; a man of sorrows, and acquainted with grief: and we hid as it were our faces from him; he was despised, and we esteemed him not. Surely he hath borne our griefs, and carried our sorrows: yet we did esteem him stricken, smitten of God, and afflicted. But he was wounded for our transgressions, he was bruised for our iniquities: the chastisement of our peace was upon him; and with his stripes we are healed. All we like sheep have gone astray; we have turned every one to his own way; and the LORD hath laid on him the iniquity of us all. Hoping: to get some sewing done! Feeling: the need to take full advantage of sunny days! Here’s a tutorial at “Pink Tea” blog for some cute little barrettes that feature strawberries made from ribbon. They would be fun for a little girl and also for a “bigger” girl’s craft project. The last step doesn’t quite make sense to me as it wasn’t clear how far the wrapping was to be done on the inside. However, just keep in mind that you want the ends tucked in and the barrette still able to be closed and hold the hair. For those of us who do not observe the Christmas holiday or who don’t do so in all the traditional manner, the questions from others regarding why can sometimes be difficult to deal with, especially for children. In this article I attempt to give some positive ways that this can be addressed, and with your children in particular. This was prompted by a reader’s question/comment that I received earlier this year. Proverbs 22:20-21 Have not I written to thee excellent things in counsels and knowledge, That I might make thee know the certainty of the words of truth; that thou mightest answer the words of truth to them that send unto thee? A reader whose family had quit celebrating Christmas asked me what we say when someone wishes us "Merry Christmas" or asks about Christmas. She wondered how to help her children specifically to deal with such questions and comments. Kids have a tendency sometimes to state the facts in a less than gracious manner, or they can be confused about what to say or to whom. Men's souls to save and bless! To find so little done. If done in vain self-will? Till Thou Thy servant fill? Thy perfect will through me. Colossians 4:2-6 Continue in prayer, and watch in the same with thanksgiving; Withal praying also for us, that God would open unto us a door of utterance, to speak the mystery of Christ, for which I am also in bonds: That I may make it manifest, as I ought to speak. Walk in wisdom toward them that are without, redeeming the time. Let your speech be alway with grace, seasoned with salt, that ye may know how ye ought to answer every man. Luke 4:18-19 The Spirit of the Lord is upon me, because he hath anointed me to preach the gospel to the poor; he hath sent me to heal the brokenhearted, to preach deliverance to the captives, and recovering of sight to the blind, to set at liberty them that are bruised, To preach the acceptable year of the Lord. 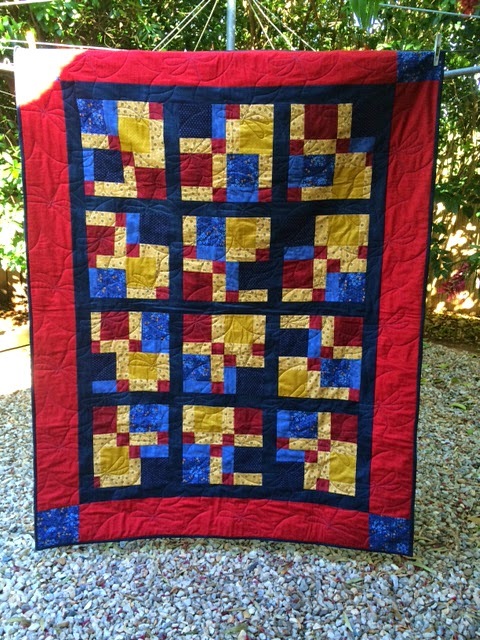 My friend Jo at “Finding Joy In the Everyday” has completed a quilt. She is a beginner and the project had its challenges for her, but the results are beautiful. She did a Disappearing Nine Patch quilt for her sister-in-law who has been through an amazing health crisis this year. I think the colors are very cheerful while still having a mature look to them. Congratulations, Jo! :-) Nicely done. See her lovely photos and read about the process here. Here’s a simple Hors d'oeuvres to make for a special meal or just for a snack. They present very nicely on a special occasion but are easy enough to make for a family movie night or even lunch. They would also be nice for tea. Cut cheese into slices in a size that will fit on the crackers and add. Using kitchen scissors, snip sun dried tomatoes into small strips putting 2-3 strips on each cracker. You may sprinkle lightly with garlic powder if you wish. Bake at 450F just till the cheese melts to your preferred point. Keep a close eye on it! I think mine was a little overdone. You can make this in any size batch. I suppose you could heat them in the microwave, but pay close attention so that your cheese isn’t ruined. Last year I put up a blog post on December 25th entitled "Because Christmas Isn't Always Merry..." A reader made some comments on it in which she talked about what a painful time of year Christmas is for some people. She pointed out that some simply can't be "merry" or keep the tradition of celebrating with family as it's presented by the world. This can cause real distress and depression for those people. I hadn't really expected to post a holiday challenge this year, but recently it popped into my head that one problem with the heavy celebration schedule that many people keep is that they fail to really see those who need to be seen the most - the hurting, the lonely, the ill, the downtrodden. I've written at length about remembering the poor and touched on the hurting and lonely people in that challenge as well as in the one to simplify your holidays. Perhaps this might seem like repeating myself, but sometimes we need to hear something from more than one angle before we really see it. My sister-in-law is doing a poll on handmade gifts for her Etsy shop. Please help her out by taking it. I think you have to be a Facebook member to do so. If you take the poll you will automatically be entered to win a free handmade gift in her drawing which she plans to do December 11 (USA time). Here’s the link to the poll: Handmade – Your Opinion! After you get done with the poll, please come back and watch this tutorial for The Falling Triangles Quilt by Jenni and MSQC (Missouri Star Quilt Co.). This is not a terribly complicated pattern, but it will make a huge quilt top fairly easily. Winter is a good time of year to work on a bigger sewing project. So, November is over. Another Thanksgiving week has come and gone. Ours was different from any we’ve had before, but I suppose one could say that about many others we’ve had as well. :-) This one…well, I’m glad it’s past in many respects! But, as my dad says, the Lord always balances our experience. There were some sweet blessings from my Savior just when I needed them most to help me over the hurdles or pick me up on the other side! I had some sweet emails and messages that were an encouragement. We enjoyed the Lord’s supper with our church family the weekend before Thanksgiving. We had visits with family and friends that were a blessing and a help. There were times for self-examination that, although not pleasant, were useful and hopefully productive. We had some interesting and busy times as well. Some things got done. Some friends joined us for Thanksgiving dinner and we had some food adventures too. I thought it might be fun to share some of these things with you. First of all, all three of the working men on the property were off the whole week, which was nice for all the families. Also, the weather was beautiful most of last week – mostly sunny and warm. The fall colors were splendid here! There are oak trees on our property that put on a gorgeous show some or most years. He was cutting little fabric loops to hang some string lights in our bed room. These lights are not for Christmas, but for ambiance. They’ll be used all year. Of course, this is the time of year to buy them and he wanted LED for the lower watts, so we picked some up when we were in Costco one day. This is how he used the tabs. The fabric blends quite well with the trim. Chicken baked with coconut flour, butter and spices. Potatoes baked with coconut oil and herbs. Tabouli made with quinoa, gluten-free pasta salad and rolls, two kinds of hummus, and watermelon rind pickles (made by me). The gluten-free foods that were styled after traditional ones varied in goodness. I’d say the rolls, tabouli and cookies were the best. Everything tasted good, but some things had a different texture. The food also affected my system a little differently than the usual gluten foods do. This year he made cinnamon rolls! Yes! He made them the Saturday after Thanksgiving Day and part of our local family joined us to eat them warm from the oven. We had more the next morning when some of us ate breakfast/brunch together. Maybe it’s been too long since I had cinnamon rolls, but even with all respect to my mom, I think these were the best I ever ate! They were SO good. Praise the Lord for His kindness and for the many blessings! My grandfather with his four children sometime in the 1950s. The original of this was actually written by someone else, though I don’t know who it was. It has been altered extensively to make it more biblical. Hold your children accountable for their behavior. Give them boundaries and make it clear that there will be repercussions if they cross those limits. Example - In the Old Testament Law God told His children "thou shalt not" and then prescribed set punishments if they did anyway. Give them responsibilities and hold them accountable if they fail to do as they have been instructed. 1Cor. 4:2 Moreover it is required in stewards, that a man be found faithful. Someday they will give account of themselves to God. Ultimately, you are preparing them for that day. Rom. 14:12 So then every one of us shall give account of himself to God. Show them that the point of accountability is not so that you can punish them for every mistake but rather to help them grow in their ability to bear responsibility. Galatians 6:2-5 Bear ye one another's burdens, and so fulfil the law of Christ. For if a man think himself to be something, when he is nothing, he deceiveth himself. But let every man prove his own work, and then shall he have rejoicing in himself alone, and not in another. For every man shall bear his own burden. Isaiah 40:25-26 To whom then will ye liken me, or shall I be equal? saith the Holy One. Lift up your eyes on high, and behold who hath created these things, that bringeth out their host by number: he calleth them all by names by the greatness of his might, for that he is strong in power; not one faileth. One thing that has been a bit of a hindrance to me in buying batiks is the price. After watching how these lovely fabrics are made, I don’t feel that I can complain any more. This is an amazing process that still involves people working very closely with the fabric, dyes and design! It is really like owning a piece of artwork when you realize all the hands on work that goes into making it. THANKSGIV'ING, ppr. Rendering thanks for good received. THANKSGIV'ING, n. The act of rendering thanks or expressing gratitude for favors or mercies. As for the sake of getting more! Gratitude is an offering precious in the sight of God, and it is one that the poorest of us can make and be not poorer but richer for having made it. Grateful for laughter -- and grateful for pain. Lord, I give thanks for the dark autumn ways. Lord, I give thanks to Thee, Giver of all! Psalms 18:49 Therefore will I give thanks unto thee, O LORD, among the heathen, and sing praises unto thy name. Psalms 30:4-5 Sing unto the LORD, O ye saints of his, and give thanks at the remembrance of his holiness. For his anger endureth but a moment; in his favour is life: weeping may endure for a night, but joy cometh in the morning. Psalms 106:1-2 Praise ye the LORD. O give thanks unto the LORD; for he is good: for his mercy endureth for ever. Who can utter the mighty acts of the LORD? who can shew forth all his praise? 2 Thessalonians 2:13-14 But we are bound to give thanks alway to God for you, brethren beloved of the Lord, because God hath from the beginning chosen you to salvation through sanctification of the Spirit and belief of the truth: Whereunto he called you by our gospel, to the obtaining of the glory of our Lord Jesus Christ. Dream back across the years. Thanksgiving day is just around the corner, and I would like to suggest 3 thoughts to encourage being thankful. 1) It’s good for yourself and your own emotional and psychological makeup. Try listing some things for which to give thanks. Dwell on those things. It’ll be good for you. If you have nothing to be thankful for, get saved! 2) It’s good for those around you. There aren’t too many people who like to be around a whining, complaining, ungrateful person. You’ll be much more of a blessing and witness to your family and friends if you put thankfulness into practice. 3) It’s good for the Name of Jesus Christ. Why? Because it’s God’s will. Oh, one more thing. You’ll be the winner. How can that be? John 13:17, says, “If ye know these things, happy are ye if ye do them.” Wanna be happy? Give thanks. It’s in God’s Holy Bible. Life is a journey, not a home; a road, not a city of habitation; and the enjoyments and blessings we have are but little inns on the roadside of life, where we may be refreshed for a moment, that we may with new strength press on to the end - to the rest that remaineth for the people of God. But our Jesus sets us free. When you cannot rejoice in feelings, circumstances or conditions, rejoice in the Lord. Doth not all nature around me praise God? If I were silent, I should be an exception to the universe. Doth not the thunder praise Him as it rolls like drums in the march of the God of armies? Do not the mountains praise Him when the woods upon their summits wave in adoration? Doth not the lightning write His name in letters of fire? Hath not the whole earth a voice? And shall I, can I, silent be? Psalms 150:1-6 Praise ye the LORD. Praise God in his sanctuary: praise him in the firmament of his power. Praise him for his mighty acts: praise him according to his excellent greatness. Praise him with the sound of the trumpet: praise him with the psaltery and harp. Praise him with the timbrel and dance: praise him with stringed instruments and organs. Praise him upon the loud cymbals: praise him upon the high sounding cymbals. Let every thing that hath breath praise the LORD. Praise ye the LORD. Here is a pretty simple way to make an infinity scarf presented by Terry from Fabric Junction. This method is the best one I’ve seen so far. One other was too complicated and another didn’t provide such a nicely finished look. You could make this scarf wider or narrower. If you find wider fabric you could make it longer. You can also make it out of some other types of fabric – minky, fleece, various knits and possibly some woven fabrics like flannel. But, keep in mind that you want something that will feel nice against your face, and it’s probably better to use something that will drape nicely. This would be a great simple project to make with a beginner sewist this time of year. But, it does not have to be a winter only scarf. You can make it from gauze or other light weight fabrics for use during other seasons. I do recommend that you use the free arm feature of your machine if you have one for sewing around the “circle” when joining the ends. It seems to me that it would be easier than the way Terry does it here. As usual, I was not asked to post this video and received no compensation for doing so. Here are some home décor items you can make, possibly with things you already have on hand. Most of these could be made with your kids as well and some are appropriate for even young children. Book Page Pumpkin Tutorial by Kara at “Creations by Kara”. Here is a cute way to recycle or upcycle a book you don’t want any more. Turn it into a pumpkin. If you don’t have orange spray paint be creative. Let one of the kids color the page edges with an orange crayon or chalk, or do it yourself. These Newspaper Leaves over at “Life with Little Ones” are a simple project that would be fun with children. You don’t have to use newspaper. White or light colored, light weight paper could work just as well. If you’re careful you might recycle pages from an old phone book or something of a more similar weight to newspaper. Here are some leaf rubbings that my sister-in-law in Australia made some years ago. As you can see, she made them on plain white paper. This makes me think – you could frame “artwork” like this. Do the various leaves in different fall colors for more pop. Now this is a project that I really want to make! I might make it non-seasonal by using green leaves or some other translucent covering, though I really like the autumn leaves. Maybe some interesting fabric scraps? If you missed the first parts of this study on the birth of Jesus, you may wish to go back and start at the beginning. This week the subject matter will probably be more controversial in some ways. This discussion will include the teaching of Jesus Christ on the subject of divorce and marriage as well as a few thoughts on our great Saviour and why He came. Hebrews 6:18-20 That by two immutable things, in which it was impossible for God to lie, we might have a strong consolation, who have fled for refuge to lay hold upon the hope set before us: Which hope we have as an anchor of the soul, both sure and stedfast, and which entereth into that within the veil; Whither the forerunner is for us entered, even Jesus, made an high priest for ever after the order of Melchisedec. You can also “shop your own stuff” by selecting quilting fabrics from your stash and scraps to cut into 10” sections rather than using fat quarters. I probably have quite a few scrap pieces that would work for this. Reader’s Comments – Why Do Americans Decorate for the Seasons? I thought it might be interesting to address some reader’s comments in posts, so I’m going to start a new series. Some of these may come from email from the Home Maker’s Corner, but I think most will be comments made here at the blog. I don’t know if this custom came from other European countries or not. I know Australia has had primarily a British influence. I haven’t researched this subject, so take this as my opinion and observations. First off, both the U.S. and Canada have a historical Thanksgiving Day to celebrate the harvest. This particular holiday happening in the autumn, which is unusually beautiful in parts of North America, lends itself to decorating with the gorgeous foliage and produce of the season as well as things associated with the first Thanksgiving in the U.S. – leaves, pumpkins, Indian corn, squash, apples, grapes, acorns, etc. Summers in North America can be long and hot in some parts, so autumn is also a welcomed relief from the heat – something worth celebrating. Also, since school starts at the end of the summer, autumn offers the first big seasonal “craft project” opportunity for the kids. Often these projects are items to be used for décor. Sadly, Halloween has been built into one of the biggest holidays in the U.S. I can’t exactly say how this happened, but due to its overtly devilish connections I’m sure that Satan has made much of the opportunity to encourage it in many ways. The longish time period between July 4th (Independence Day) and October 31st without any significant decorating holidays, has probably contributed to people’s “need” to make it big in the U.S. In addition, much of the U.S. and Canada have very distinct seasons. Winter is long and dark and cold in many areas so spring is anticipated eagerly, and in some parts of the continent spring is spectacular. When the flowers appear it’s a natural tendency to bring some inside – daffodils, tulips, pussywillows, apple blossoms, dogwood, redbud, etc. In fact, some of the tree blossoms can be cut and brought inside to bloom early. The spring observance of the Lord’s resurrection, which has very sadly been combined with ancient European and Middle Eastern fertility cults and so named Easter, naturally lends itself to certain springtime decorations being used since it occurs at that time of year. May baskets, a former custom brought from the Old World, I believe, were given in some parts of the American continent at one time. Of course, the usual decorations for the Christmas season have been around for ages and came from the Old World, again much of it dating from ancient times and other religions. In the very early years it was not observed much or at all in parts of the U.S., and only became a huge holiday later on. The usual firs, pine, spruce and holly were available here, but there were also other things such as bittersweet vine and cranberries which were late autumn items that could be stretched into December. Now, I believe that one reason decorating for the seasons has become such a big deal is that the commercial world has capitalized on the already existing tendencies or interest. The manufacturers of goods have come up with a massive array of artificial decorations and many different products. Gardening stores, food markets and florists have offered a variety of real plants, foods, vegetables, fruits and flowers. Seasonal sales have become a big, big deal for them all. It is very profitable, and every year there are a number of holidays and seasons that can be used to promote sales. In short, it’s a huge money making opportunity for them. In somewhat more recent times Halloween, Independence Day (July 4th), Valentine’s Day, St. Patrick’s Day, and perhaps other days have been built into more than they originally were as well. Pushing the “seasonal décor” relating to these holidays, in addition to the others, has increased the profits of sellers and increased the amount of purchasing and decorating being done. It has not been that difficult to convince a willing market to increase their spending and decorating habits in relation to the seasons. In addition to the increased advertising, DIY and crafting sources (shows, web pages, catalogs, etc.) and decorating experts have added to the “need” for seasonal décor. They have introduced a vast array of “possibilities” and often offered products from “sponsors” to make the projects easier. If you want to you can now redecorate your entire house for some holidays or seasons such as Christmas and autumn. Basically it’s very clever marketing, and it works or they wouldn’t do it. So, I guess the short answer would be that our distinct and beautiful seasons combined with the holidays being pushed and promoted by sellers of goods has resulted in a tendency of many to over-do things as far as decorating for the seasons is concerned. For my own part, I don’t object to some modest changes of décor for the seasons. I enjoy it and would probably bring in natural things more if I could or needed to. As it is, I do some seasonal decorating, but mostly in one place – the dining room, and mostly on the buffet and table there. Fall and spring tend to be my favorites for changing up the décor, but I also have a collection of snow themed items that I use most years in the winter. Summer is a long season here in Texas, so what I put out then stays the longest I think; and perhaps our fewer real seasons here is one reason I like to decorate a little inside. I have pretty much limited myself to one large storage tub for my seasonal items. Except for the natural things I sometimes use (pumpkins, squash, flowers, etc. ), I store most of the items I use in that tub and try not to accumulate more than that. I probably need to “delete” a few items. I don’t mind changing the few items on the buffet and table, and the table sometimes gets changed randomly (a different table cloth or placemats for whatever reason). Some few of the items are year round items that stay in the mix anyway, or can if I want them to. :-) Some things just get moved from their normal spot to the buffet for the season so it is more rearranging those items. My spring décor on the buffet a few years back. My Fall décor a year or two ago. Yes that is a rug on the right. We got it for fifty cents at a yard sale. :-) The beautiful doily was made by my Gramma Hoover and is a “regular” there. I’m thinking the cat tails need to be “deleted”. My dining room table one year at Thanksgiving. The leaves are artificial and were snipped from a “bush”. I saved seeds from the little squash and my dad grew some the next couple years.